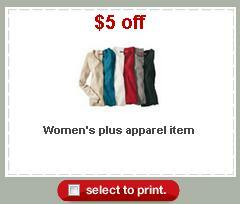 Head over to Target.com and print this $5 off 1 Women’s Plus Apparel Item. You should be able to find an item for close to free in the clearance section. Or Check out the other apparel coupons from Target.